Condensate and shale gas well liquids are light end oils that are in vapor form at original reservoir conditions. As pressure and temperature decline downstream, they condense into liquid form. With depletion, as pressure declines throughout the system, these liquids condense further and further upstream. Ultimately, liquids accumulate in the well bottom and in the near wellbore region of the reservoir, impeding the flow of gas. One point that differentiates condensate wells from shale gas wells is the mobility of the liquid phase in the reservoir. the porosity of the reservoir material is much lower, and any liquid that condenses in the near wellbore region becomes immobile (stranded). by producing the well at high bottomhole pressure. This is explained in depth by Asbjorn Holme in his 2013 MS thesis entitled "Optimization of Liquid-Rich Shale Wells", [Eagle Ford] from which the following charts and data are taken. A link is provided to this thesis in the "References" page. Bottomhole pressure has a major impact on the amount of liquids produced. 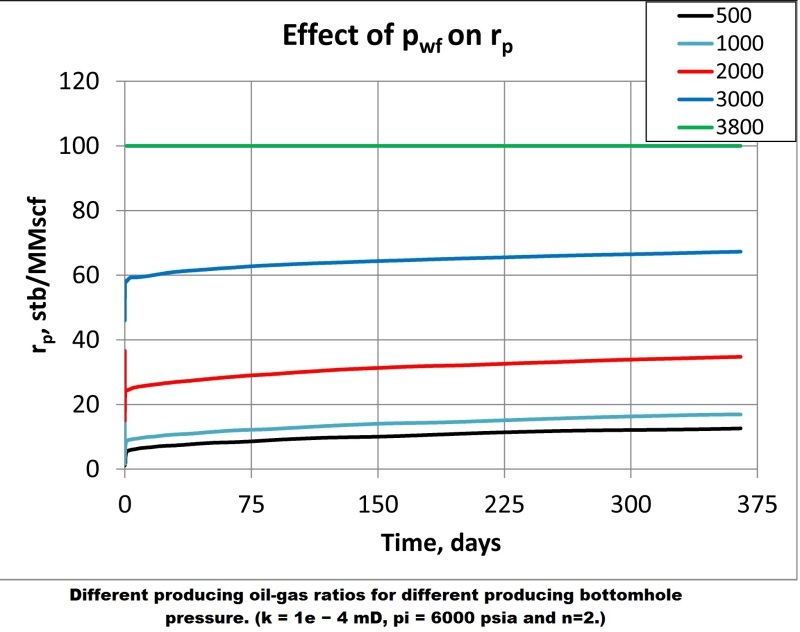 As can be seen from the chart below, the liquid-to-gas ratio (LGR) is up to 10x greater when the bottomhole pressure is increased from 500 psi to 3,800 psi, assuming an initial reservoir pressure of 6,000 psi. 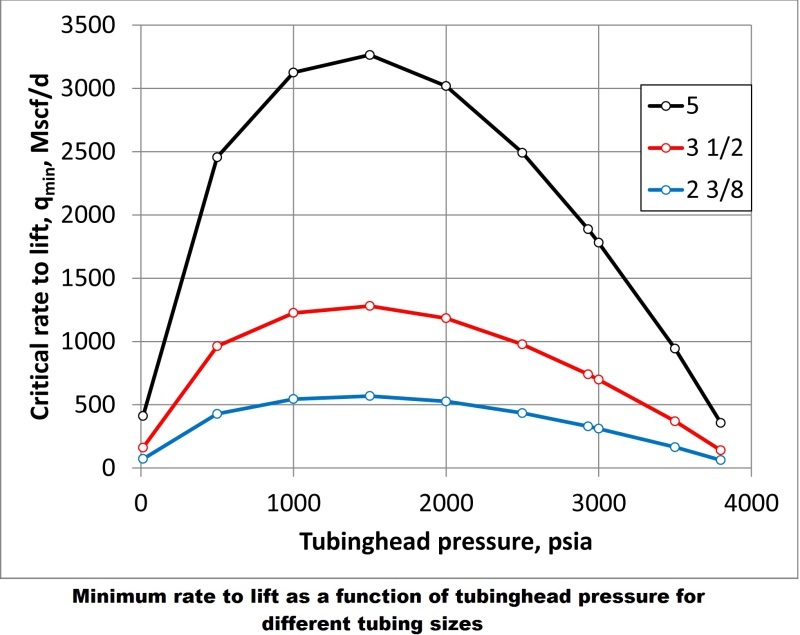 ​But producing at high bottomhole pressure promotes liquid loading. 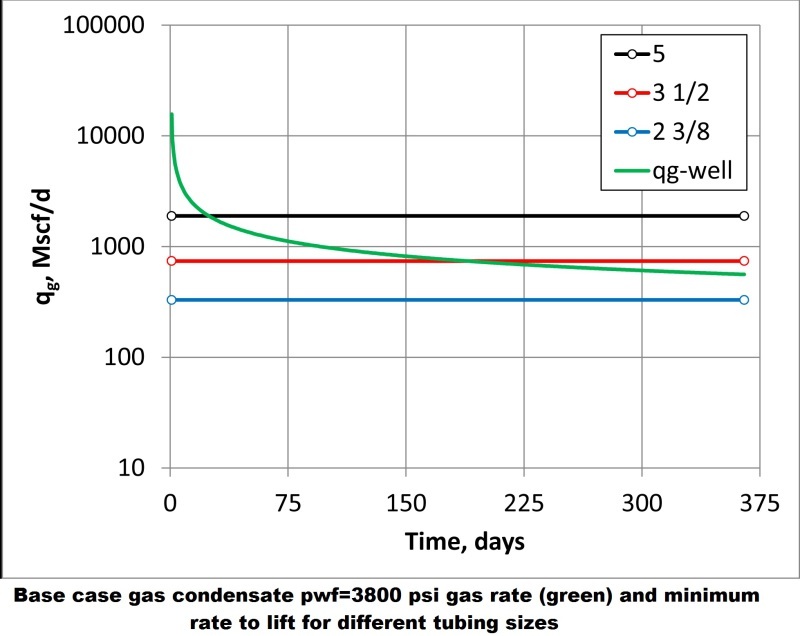 The reduced drawdown results in less gas volume produced (~ 3x to 4x less when BHP increased from 500 to 3,800 psi), reducing the velocity of gas flowing up the tubing. ~2 years (see chart below). One suggested design is for an MCS production conduit to have six 1-inch diameter passageways instead of 2 3/8-inch (1.995-inch ID) tubing as suggested by the author. By providing more flow area, near term production can be increased. And the minimum velocity to maintain steady state flow would be lower than anticipated production levels for the initial period of focus on liquid production (3 to 5 years), after which bottomhole pressure is reduced to under 1,000 psi to focus on gas production rates. So, near term production is increased using MCS production tubing and artificial lift is avoided. For gas condensate wells, a limited section of MCS production tubing at the well bottom can be used to increase the gas production rate by reducing "condensate banking" (blockage). It can be viewed as another form of downhole choke (reducing flow pressure downstream), but instead of the potential energy (pressure) being rejected/wasted, it is used to lift entering liquid up the well. condensate returning to gas phase.